I loved this story so much, it was published in the December issue of Gloria Home. When my editor asked me for a story about interior design, I remembered I read somewhere about Diana Mausser and her “Native Tile”. I talked to lovely Diana and was truly inspired by her story and her work. 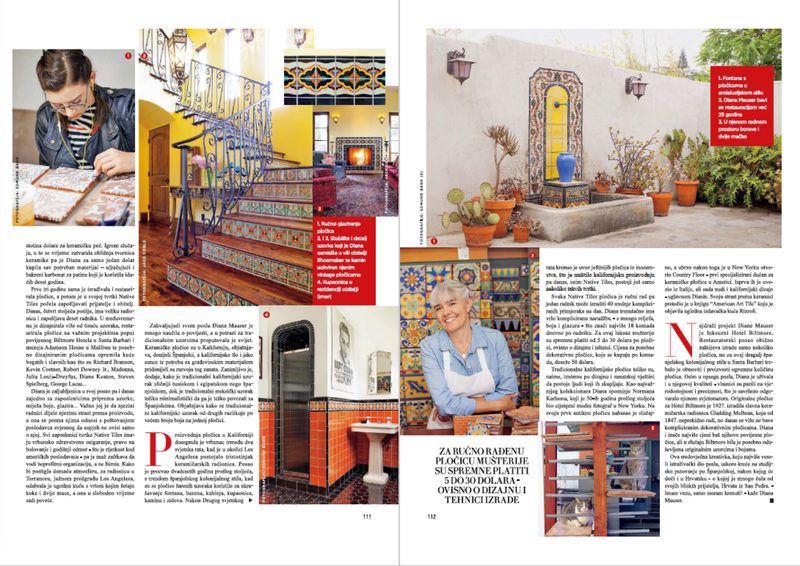 And I learned a lot – about the process of creating artisan tiles, about people who love and collect them and about how style travels through space and time. Diana was freshly out of UCLA and working in a tile store when a gentleman walked in with an antique terracotta tile showing Saint George killing a dragon, and asked if they could restore it. This is not what the store normally did but Diana was intrigued and volunteered to take on the project. The gentleman loved the result and Diana fell in love with the restoration process. She found a tiny workshop in Marina del Rey, spent a few hundreds of dollars on a kiln and bought all necessary materials from a near by ceramics factory which was closing down for only $2. As more work came in, she started employing friends and family, and soon moved to a bigger, more beautiful workshop in Torrance where today she also has cats and chickens. Now she’s working on fantastic projects such as renovating the tiles in the luxurious Biltmore Hotel in Santa Barbara and Adamson House in Malibu, but also creating custom tiles for private residencies. In 25 years, she’s designed over 1100 patterns. Diana still works hands on in her workshop together with her 10 employees, but now she also travels the world learning about the history of tiles and different regional designs. What a joy in this hands on, creative, honest, beautiful work! P.S. Here some trivia: Californian traditional tile design looks more Egyptian or Tunisian then Spanish. Between 1910 and WWII, there were more then 300 ceramics factories in California – today there are only a few.